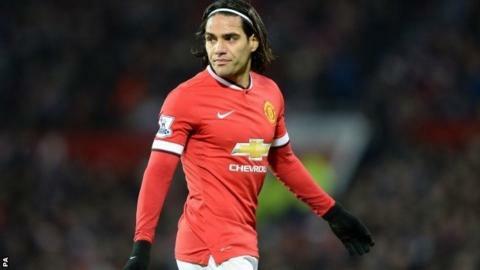 Manchester United striker Radamel Falcao may not be at Old Trafford next season, according to his agent. The Colombian, who earns £265,000 a week, has scored three goals in 13 appearances since signing from Monaco in a £6m season-long loan in September. United have until May to activate a £40m buy-out clause. "He will play in one of the very best clubs in the world next season, whether that is Manchester United or not," said the 28-year-old's agent Jorge Mendes. Falcao's career at Old Trafford has been hampered by a calf injury and he has started only eight matches. He was dropped from manager Louis van Gaal's 18-man squad for the 1-0 home defeat by Southampton on Sunday after starting the previous five games. Afterwards Van Gaal said there was no injury problem and the decision was tactical. "It is very difficult for Manchester United fans," Mendes told Sky Italia. "They have an absolutely brilliant player, one of the very best in the world, who would without any doubt play 90 minutes of the match, every time, with any other club. "The truth is, right now, we don't know what will happen." Falcao has already decided he will not be returning to Monaco, who he joined for a reported £50m in May 2013 after prolific spells at Atletico Madrid and Porto. United's Netherlands midfielder Daley Blind returned to play 90 minutes on Sunday after injuring a knee in November. "The places in the team are expensive, and the manager has said that as well," he said. "So you have to train, every day, very hard to show yourself and show that you really want to play." How BBC Sport reported Falcao's late-night move on Transfer Deadline Day in September. Balotelli, Lambert to leave Liverpool? Read more on Transfer news: Balotelli, Lambert to leave Liverpool?